Edward Dolnick, a former Boston Globe science writer now living near Washington, D.C., reads from his new book “The Forger's Spell: A True Story of Vermeer, Nazis, and the Greatest Art Hoax of the Twentieth Century” at the Harvard Book Store, 1256 Massachusetts Ave., Cambridge, at 7 p.m. Tuesday, July 22. The event is free. “The Forger's Spell" is the true story of Johannes Vermeer and the small-time Dutch painter who dared to impersonate him centuries later. The con man's mark was Hermann Goering, one of the most reviled leaders of Nazi Germany and a fanatic collector of art. 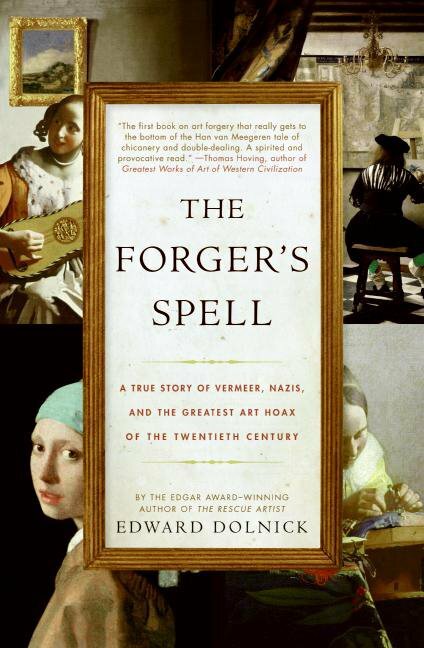 Van Meegeren found that a forgery that was close was almost worse than if he hadn't tried at all, because as soon as it was close, the experts would focus on the difference between the forgery and the real thing. What turned out to be a much better strategy for van Meegeren was to make a painting that had a few hints of Vermeer but that wasn't like any of the known Vermeers, and then let the experts fill in the gaps themselves. Let them say, "Aha, didn't I always tell you that Vermeer had much more to him than you thought? It's not all ladies reading letters, it's sometimes completely different paintings like this new one we've just found."